An iconic image of the Broughton Strait, the BC Ferries Quadra Queen II plies the waters between the coastal communities of Port McNeill on Northern Vancouver Island, Sointula on Malcolm Island, and Alert Bay on Cormorant Island. This Tri-island ferry service provides daily transportation for both passengers and vehicles. 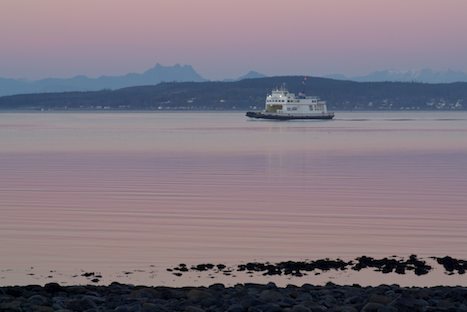 The sailing schedule for the Quadra Queen II varies depending on the season so it is recommended to consult the BC Ferries website for the up-to-date schedules. Alternatively pick up a copy of the schedule from the Port McNeill, Sointula, or Alert Bay ticket booths. Every Tuesday two sailings are set aside for dangerous cargo where no other passengers are permitted on board. The BC Ferries tri-island ferry service operated on the Quadra Queen II on Northern Vancouver Island, British Columbia, Canada. Picture of the BC Ferries tri-island ferry service near Port McNeill on Northern Vancouver Island.